Building technology with its many intelligent functions is now mobile – it can be operated, monitored and controlled with SmartPhones and tablet PCs. Especially attractive: control with Gira via iPhone, iPod touch and iPad from Apple. Modern living is no longer imaginable without intelligent functions for more comfort, safety and economy. As a supplier of solutions for building system technology, Gira feels obliged to make buildings more intelligent. 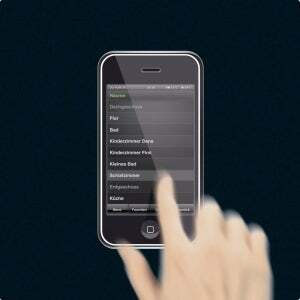 The mobile operating devices from Apple, such as the iPhone and the iPad, are also clever and trendy. Gira and Apple complement each other ideally: Two strong, design-oriented manufacturers make building control and automation even more attractive. Using special Gira apps, it is possible to operate the complete range of building technology simply and elegantly – on the go or from any room within the building – using an iPhone, iPod touch or iPad via GSM, UMTS or WLAN. Because this solution does not access building technology using a web interface, it is extremely quick as well as secure with regard to transmission: control is practically implemented in real time. The new Gira applications communicate with the Gira HomeServer, the ‘brain’ behind the building control system, or with the Gira FacilityServer. The Gira Interface adapted to the touch screens of the mobile devices visualises all of the functions clearly and concisely, enabling their quick access. As Apple fans already know: either horizontal or vertical display can be selected and can be modified simply by rotating the device. Various menus can be displayed on the touch screen. The main menu displays all building functions. In the room view, all rooms are displayed according to floors. A touch to one of the sections opens the overview of all the applications installed in a room. In the room functions, all devices within a room as well as their respective status are recognisable at a glance. For example, lights can be switched on or off with a single touch, and blinds can be raised or lowered. With more complex functions, e.g. control of heating, a pop-up window of the room view is opened. In landscape mode, a time clock makes various filter functions available which can be adapted to the personal needs of the user. The data from a weather station is also displayed on the touch screen, for example wind speed, precipitation or outside temperature. Consumption data can be evaluated and visualised using diagrams displayed on the touch screen. Various values can be displayed according to year, month, day and hour. Cameras can also be integrated in the functions: users can see who is in the garden or at the gate with just one operational step. The apps are available exclusively in the Apple iTunes Store. Further information about the Gira Apps is available at www.gira.com.